River Audio are delighted to have worked with the Audio Visual technicians at Plymouth University who first came to us for live sound training via our sister company Base Sound. 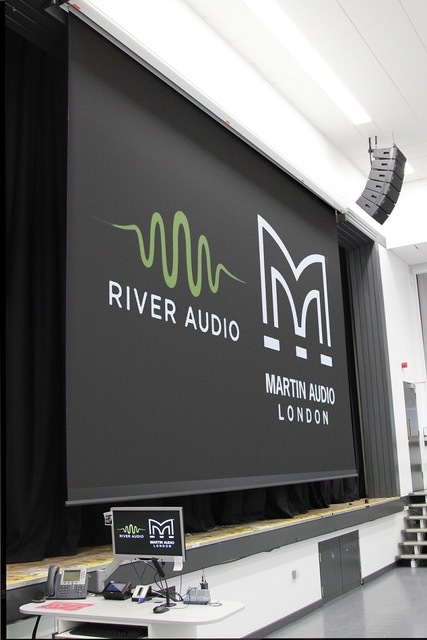 We provide training using a variety of professional live sound systems and during the training days they were mixing on the new Martin Audio Backline range which they were really impressed with. As part of an update at the university they wanted to transform the sound of one of their large halls which has a capacity of 900 people and is used for a variety of important college events ranging from lectures, presentations to performing arts and music events. Whilst they have a large ground stacked Nexo system which is used for dance music events they wanted to install a high quality but also discrete sound system that could deliver excellent vocal clarity and power. 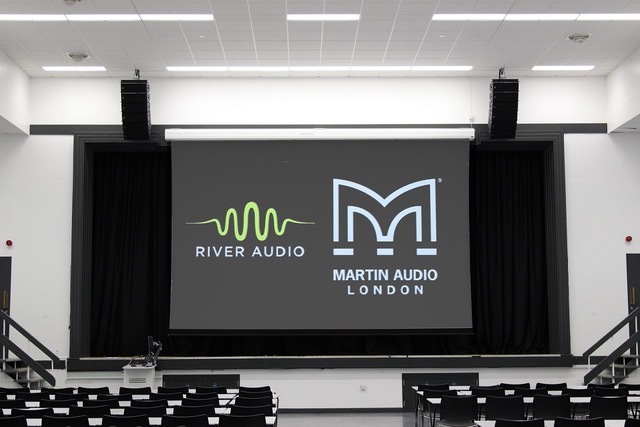 Having looked at line array technology they were immediately taken with the new range of Martin Audio Precision line array systems and in particular the WPM https://martin-audio.com/products/loudspeakers/wpm which uses 2 x 6.5” mid range drivers along with 3 x 1.4” compression drivers in a very compact enclosure and can deliver 130db of crystal clear, controlled sound. As the room is quite reverberant it was essential that the sound did ricochet off the walls and ceiling muddying the sound and so the controlled dispersion of the the mini line array was ideal. The system we installed comprised of 12 of the Martin Audio WPM mid, high enclosures (6 each side) along with 4 of the SX118, single 18” Sub Bass Speakers (2 each side). The entire system is powered by 2 Martin Audio Ikon, 8 channel IK81 amplifiers in single box resolution with all the processing and limiting programmed within the amplifiers. The complete system was installed and flown discretely as two clusters high up in the ceiling, either side of the stage and delivers, incredible, high quality speech and music reproduction. As a result of the new sound system installation the hall is now being used daily for a multitude of events and is widely praised for the quality of sound. It was a pleasure working with the university staff and technicians and hope there will be more opportunities in the future.